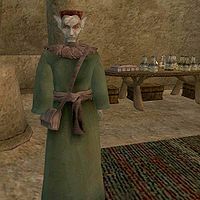 Folvys Andalor is a Dunmer healer who works at the Ald'ruhn Temple. He sells ingredients and potions, as well as a wide selection of spells. He keeps a constant supply of various restorative potions, as well as the following ingredients: Ash Salts, Corprus Weepings, Emerald, Guar Hide, Rat Meat, Scamp Skin, Scrib Jelly, Scrib Jerky, and Scuttle. * This spell is actually completely useless, since you can't cast spells while paralyzed. However, it does give you access to the effect in case you want to make an "On Touch/Target" version of the spell, though even this will be very rarely needed.